Bradford B or not Bradford B - that is the question. Prince Henry would have been puzzled by my latest project and getting "thee to a nunnery" wouldn't have clarified things much either. Hamilton had an Awards Division that produced fine watches for companies and organizations to use as awards and presentations. Many times Hamilton's customers would not want their recipients to be able to find their award in their local jewelry store. So the Awards Division would use designs from discontinued models and mix things up with slight dial variations. You can often spot an Awards Division watch because it says "Masterpiece" on the dial. Are they legitimate Hamilton models? Sure, why not? However you won't find them in the catalogs so a lot of collectors don't view them as desirable as a catalogued model. I get a lot of emails from people with questions about a family watch. I like to help people out and that's one reason why I started this blog. I recently received an email with the attached picture, with an inquiry about how to get it restored. The watch looks very familiar but the "Masterpiece" on the dial is a giveaway that it's an Awards Division watch. A little sleuthing and I was able to determine it's a variation of the Bradford, although it would be easy to confuse with a Parker as well. What's interesting about this watch is it was presented for 25 years of service in 1966 - long after the Bradford was discontinued. 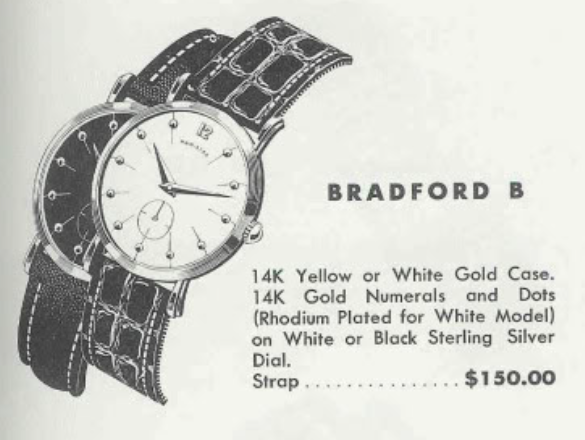 The Bradford was initially introduced in 1954 with a solid 14K yellow gold case. 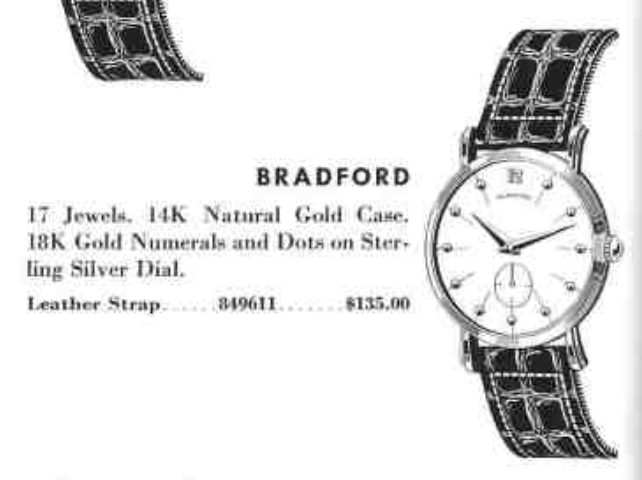 In 1955 a white gold version of the Bradford was also made available. The Bradford was produced for two years before being replaced by the Bradford B.
Hamilton used B models when the movement was changed inside the watch, requiring a slightly different case configuration and dial feet locations. From the outside you cannot tell the difference between a Bradford and a Bradford B. The original Bradford used the 17 jewel 8/0 sized 747 movement. That movement was replaced by the 730 movement but some higher end models received the newly introduced 12/0 flagship movement - the 22 jewel 770, which came out around the same time. So if you have a Bradford with a 747 inside it's a Bradford and if it has a 770 inside, it's a Bradford B. The Bradford B was produced for several more years with production ending in 1962. You could get it in either yellow or white gold and with a white or black finished dial. There was also an option of a diamond-dial as part of the catalogued "Masterpiece" line - but not to be confused with the Awards Watches. The diamond dialed version does not say "masterpiece" on the dial - it just has 11 diamonds in all but the number 12 location. That was a pretty hefty option though - and it doubled the cost of the watch so there aren't too many Bradford B Masterpieces floating around. Back to my project watch, I agreed to take it on because I thought it would be a good project for the blog and the current owner is the recipient's son. There are no better watches than family watches, regardless of brand, in my opinion. This Bradford needs some help though, and I'll start with finding out if it's a Bradford or a Bradford B. 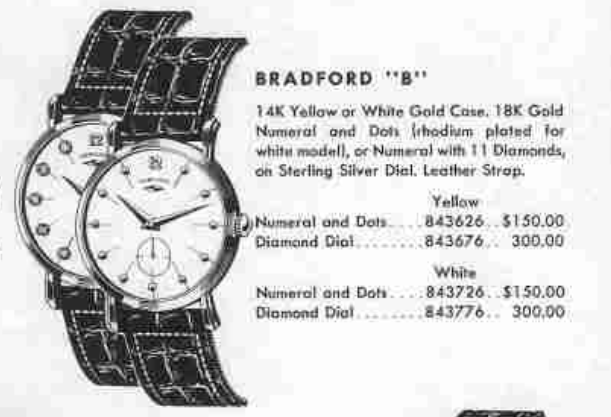 As stated above, the watch was presented in 1966, long after the Bradford and Bradford B was discontinued. It could have a 730 movement inside or even a 731, based on the 1966 year. The dial's finish is compromised all the way around the perimeter. One of the challenges of Awards Division watch dials is to get them refinished correctly. Catalogued models are usually easier to get right than non catalogued models, as the latter might have been special orders originally. In addition, this dial has a pearled track - it's often a coin toss on whether it will be done correctly. 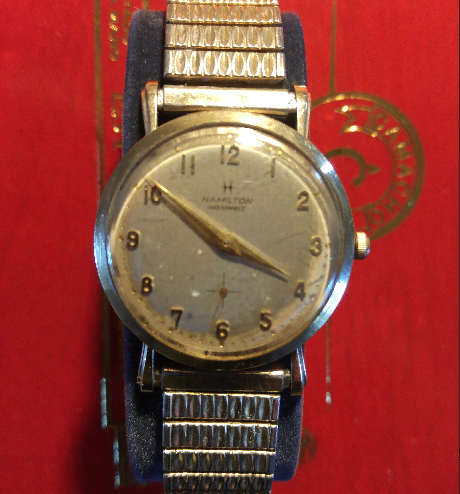 The mystery solved - this watch has a 770 (I figured it would) so it's a Bradford B. The crown is a replacement but it's "okay". This isn't a waterproof watch but the crown is. It's not a big deal one way or the other, as it looks okay on the watch. I'm sure at this point this case looks like any other yellow Bradford B case. An 8/0 movement would not fit inside this recess. I can see a couple of watchmakers' marks inside - that explains where the odd crown came from. Coincidently I recently picked up a spare 770 movement and look what it came with? An original Bradford B dial. There are a couple of minor spots but after 50 years you might expect a blemish or two. The movement is noticeably cleaner and sparkling after a trip to the spa. The watch is running nicely... just a smidgen slow but that's easily corrected. A very minor tweak to the regulator index and the watch is running right on the money. The crystal that was in the watch was a little small and was glued in. That might have been why moisture got in. I'll measure it and put in a new crystal that is slightly larger. 29.3mm will do the trick. This Bradford B is now back to showroom condition, except for a tiny black spot next to the 12. It's a beautiful watch and although it doesn't have the original dial installed, it's 100% revertible... not that you'd want to put that old dial back inside. I'm sure Prince Henry would be pleased. I can't find anything out about a watch I have that says Bradford on it can you recommend anyone who can help me out with this? I have a watch that looks almost identical, except it is gf, not gold, and missing the gold mark under "Hamilton"
Has 770 movement. I found one ad in photobucket for Thincraft 1, but that is all I can find out about it. If a Thincraft II has a 735 movement, why would Thincraft I have 770? Do you have any info on Thincraft I? I haven't done a Thincraft I yet so that's why it's not on the blog. It looks a little like a Bradford B but has square markers instead of round. The Thincraft I is not the same model as the Thincraft II - thus the different movements. Send me an email or contact me through Etsy and confirm what model you have.